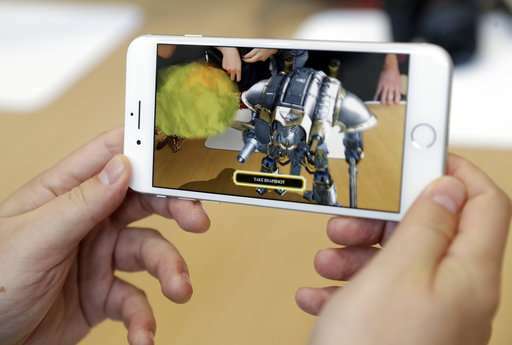 Gartner analyst Brian Blau says the iPhone X's augmented reality features will change the way people use apps and give app developers new, "cool things" to do. Apple on Tuesday showed off a simple use for this new, sophisticated camera technology with "animoji." Those let people animate emoji characters with their facial expressions. Blau says this—showing off a new technology with something that everyday people can use and understand—is what Apple does best. The analyst also praised for the extended battery life for the phone, saying that's not something that often comes with new smartphones. The leaks and rumors leading up to Tuesday's showcase at Apple's Cupertino, California, headquarters meant there were few surprises at the event. But Blau says you could tell this was a special event for Apple, which honored is late co-founder Steve Jobs in the theater named after him. Apple is releasing a super-premium iPhone with a super-premium price tag, starting at $999. While Apple is continuing to update its existing, cheaper models, the new iPhone X—pronounced like the number 10—will have a screen with higher resolution and "OLED" technology for richer colors. It will also lose a distinct home button to make more room for the 5.8-inch display, which is slightly more than the Plus model's 5.5 inches. The features are similar to what Samsung offers. The new design will enable new ways to interact with the phone. Instead of pressing the button to get the home page, you swipe up instead. 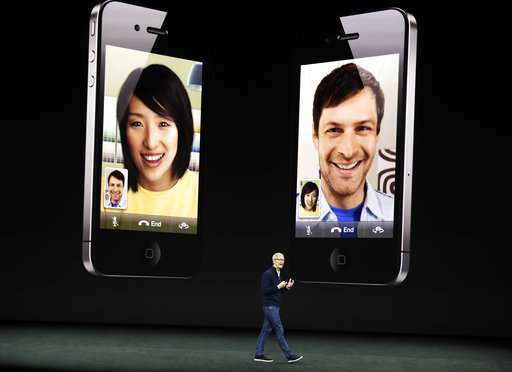 Apple is also offering the ability to unlock the phone with facial recognition rather than a fingerprint or passcode. Though some Android phones offer this, Apple is adding sensors to improve performance and says it worked with mask designers during testing to improve security. An executive initially failed to unlock the phone this way in a demo Tuesday, though. The new phone, which is coming Nov. 3, will also permit animated emojis that mirror your facial movements and promises two more hours of battery life than what's in the current iPhone 7. 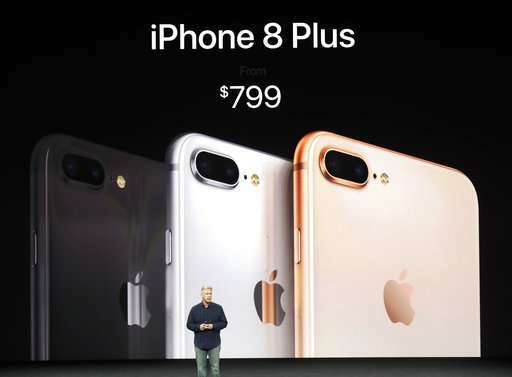 Such an iPhone has been widely anticipated for the iPhone's 10th anniversary and comes just weeks after Samsung unveils its own super-premium phone, the $930-and-up Galaxy Note 8. Apple is refreshing its lineup of iPhones with camera, display and speaker improvements. The new phones promise to shoot pictures with better colors and less distortion, particularly in low-light settings. The display will adapt to ambient lighting, similar to a feature in some iPad Pro models. Speakers will be louder and offer deeper bass. Apple is bucking its traditional naming convention by calling the new phones iPhone 8 rather than 7S. The S designation might have given consumers the impression that the new phones are mere incremental updates from the current iPhone 7. 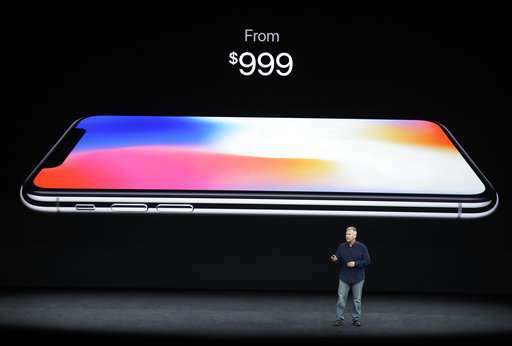 That's especially so this year given that Apple is also expected to announce an anniversary edition with additional features and a higher price tag. The Plus version will continue to have two camera lenses and now has the ability to optimize lighting as you shoot. Both versions will allow wireless charging, a feature thought to be limited to the anniversary phone. Many Android phones, including Samsung's, already have this. Tuesday's product event is being held at Apple's new spaceship-style headquarters in Cupertino, California. 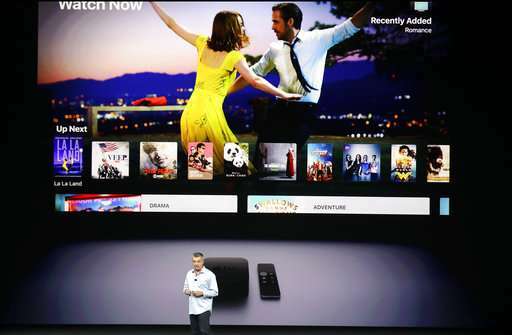 A new version of the Apple TV streaming device will be able to show video with sharper "4K" resolution and a color-improvement technology called high-dynamic range. Many rival devices already offer these features. However, there's not a lot of video in 4K and HDR yet, nor are there many TVs that can display it. Apple TV doesn't have its own display and needs to be connected to a TV. Apple says it's been working with movie studios to bring titles with 4K and HDR to its iTunes store. They will be sold at the same prices as high-definition video, which tends to be a few dollars more than standard-definition versions. Apple says it's working with Netflix and Amazon Prime to bring their 4K originals to Apple TV, too. Apple TV 4K model will cost $179. It ships on Sept. 22. A version without 4K will cost less. 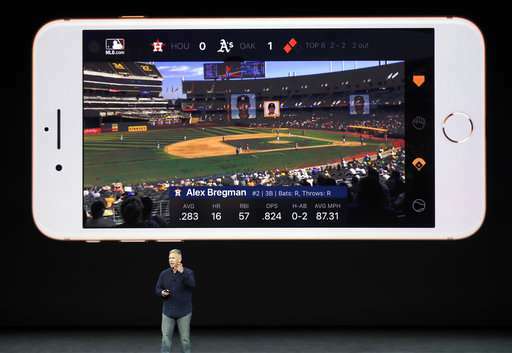 Apple is announcing it at a product event Tuesday in Cupertino, California. Apple is coming out with a new smartwatch designed to be less dependent on the iPhone. Apple Watch will still require a companion iPhone. However, a new model comes with cellular access, so it will be possible to do more—such as receiving messages—while the phone is at home. It will require a data plan, which typically costs $5 or $10 a month. 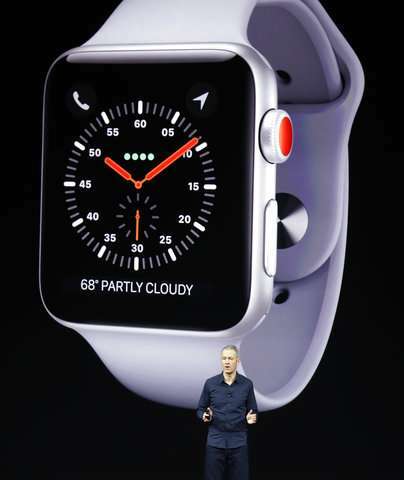 Since the original watch's debut in April 2015, Apple has been trying to enable more stand-alone features. Last year's model, for instance, introduced GPS capabilities, so that the watch can measure runs and bike rides more accurately without the iPhone nearby. The new cellular model, called Series 3, will start at $399. One without cellular goes for $329, down from $369 for the comparable model now. The original Series 1, without GPS, sells for $249, down from $269. The new watch comes out Sept. 22. A rival smartwatch from Samsung already has cellular options. Existing Apple Watches will get a software update next Tuesday. 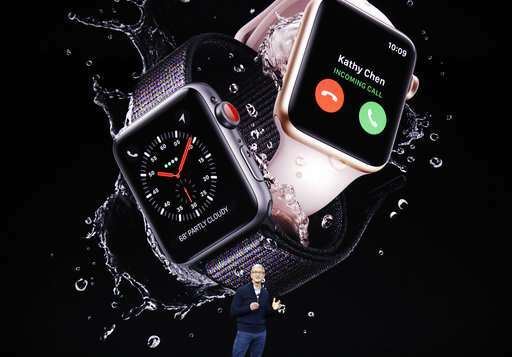 The watch details were announced as part of an Apple event at its Cupertino, California, headquarters, where it was also expected to unveil new iPhones. 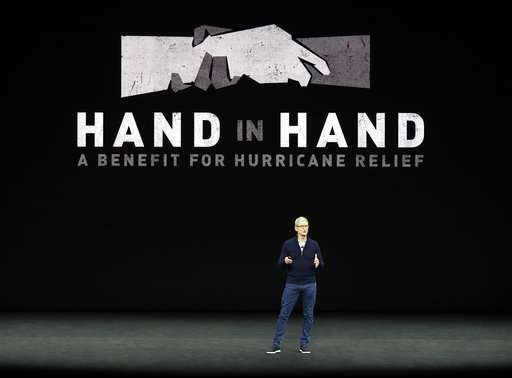 Apple is opening is product event with a tribute to its late co-founder, Steve Jobs, and a nod to those impacted by the storms devastating Texas, Florida and the Caribbean. CEO Tim Cook says Apple is working closely with the Red Cross's relief and recovery efforts. He also talks about how Apple is trying to make it easy for people to donate through iTunes. 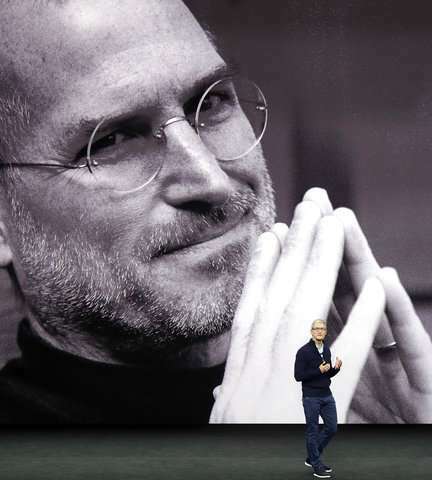 The event began Tuesday with a tribute to Apple's late co-founder, Steve Jobs. 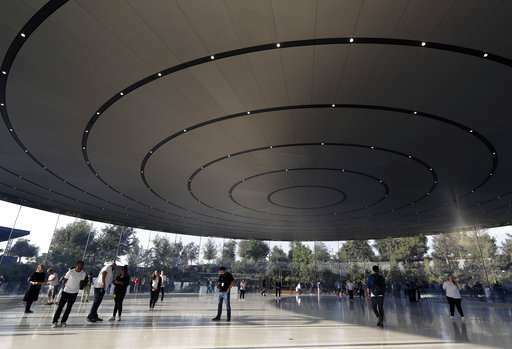 Apple is holding its first event at the Steve Jobs Theater on the company's new spaceship-style campus in Cupertino, California. 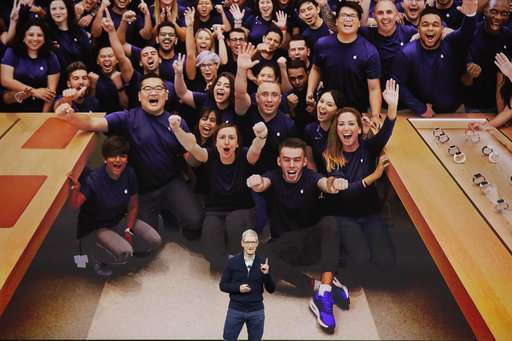 Cook says that while the Apple community still thinks about him daily, it's gotten to a point where people can reflect on him with joy instead of sadness. Apple is expected to announce new iPhones later Tuesday, including an anniversary edition with additional features. Cook says Jobs loved days like this where he could share such new products with the world. 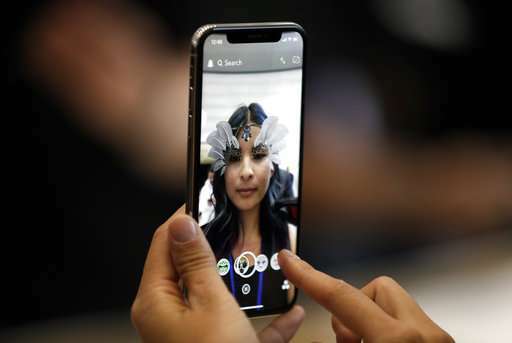 While Apple hasn't confirmed what it's going to unveil Tuesday, it is expected to introduce a dramatically redesigned iPhone that may push close to $1,000 each. 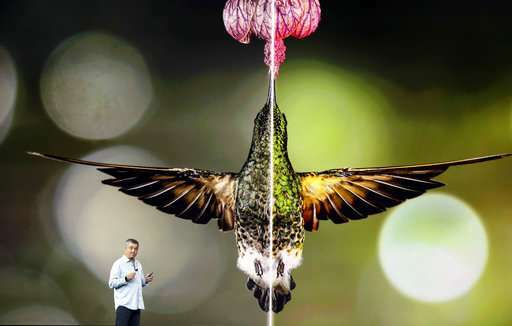 Various leaks have indicated the new phone will feature a sharper display, a so-called OLED screen that will extend from edge to edge of the device, thus eliminating the exterior gap, or "bezel," that currently surrounds most phone screens. 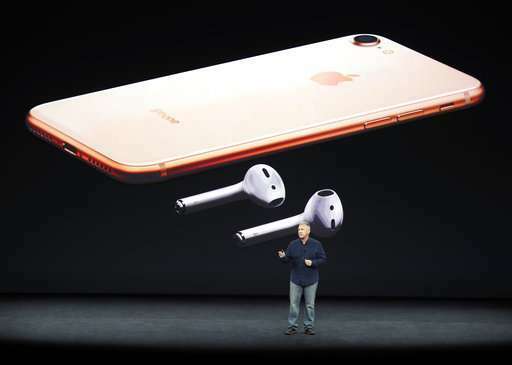 It may also include facial recognition technology for unlocking the phone and wireless charging. A better camera is a safe bet, too. Apple Inc. also is expected to announce minor upgrades to the iPhone 7 and iPhone 7 Plus. While it isn't known what companies will be supplying components for Apple's newest products, here's how some that have been associated with the company are doing ahead of the event. Broadcom Ltd. and Skyworks Solutions Inc. are down.